This website provides coats of arms images for instant download, or non-instant downloads for other specific coats of arms or products. 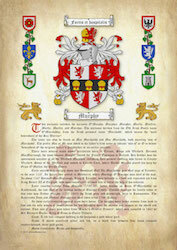 We also sell a range of surname and coats of arms products on our other websites at NameHistory.uk and HistoryofNames.uk. Surname Histories (Origin and Meaning) on A4 and A3 parchment paper. This shows the origin and meaning for the surname, the earliest mention of the name and the ancient manuscripts they appear in, spelling variants of the surname, other information and details relating to the early use of the name and the associated coat of arms for the surname. The heraldic blazon (description) for the crest (smaller image above the helm or helmet) and the shield is also included. If a motto exists this will be shown with an English translation from its original language (normally Latin, French, Gaelic or Welsh). These products are available either printed and posted or as a high quality printable or digital download. 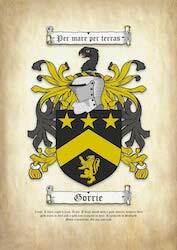 Surname Coats of Arms (or family crests) on a parchment paper or ancient parchment. These can either be a single coat of arms or a double coat of arms (which are ideal as personalised gifts for engagements, weddings and anniversaries). All available either printed in A4 or the larger A3 size, or as a high quality printable download. 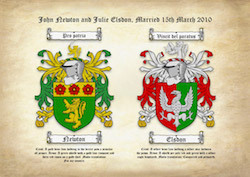 Non-instant downloadable coats of arms images as available on this website. Various other products including coats of arms coasters (with short surname history on the back), coats of arms keyrings (or key rings) with the surname’s origin and meaning on the other side, and more. Simply head over to NameHistory.uk or HistoryofNames.uk for full details and ordering.